Krish Dev is devilishly handsome, filthy rich and in need of a bride and that too quickly. With a marriage arranged by his controlling father looming over him, he has only one way to ensure his freedom and that is by getting married before he is forced in the union set up by his father which is more to his father's benefit than his own. He has set his eyes on the petite landscape designer, Maya who is ambitious, beautiful and so, suited to his requirements but does he know her as well as he thinks? Maya is here on a mission of her own and when Krish puts forth his proposition to her, she suddenly sees a way to exact her revenge from the man who ruined her family but for this, she will have to marry her enemy's son and also hide her true motives from him. A marriage in name only, they both have something to gain by agreeing and continuing with this sham if only they can resist their attraction for each other! 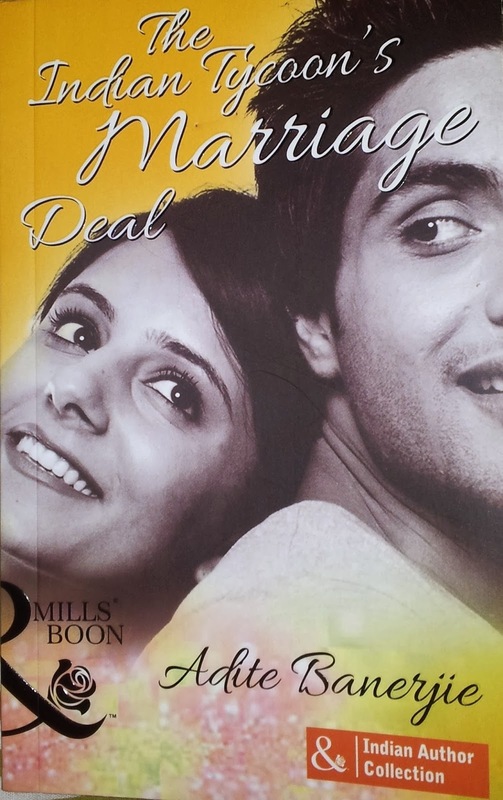 This was my first Mills and Boon story by an Indian Author and I was pleasantly surprised by the admirable fashion in which Adite has combined a Bollywood style love story with a solid plot to give us a very promising book. It is very fascinating to see that Indian authors are doing so well in the established international romance big boss banner of Mills and Boon. The chemistry between them is sensuous and the romantic scenes very entertaining. I specially loved the rakish flirting of Krish. The sad past of Maya is very sensitively and beautifully portrayed and her grief touched my heart and left me misty eyed. Adite gives beautiful descriptions of Delhi's weather turns and admirably makes them synonymous to the emotions felt by the characters at that time. "..a dust storm raged. Leaves and litter whirled around her as pedestrians ran for cover. The tall Asoka trees swayed and bent over, as if trying to keep out the devastating path of the angry storm. Maya'a angst had projected itself into the universe." A tightly and beautifully executed plot had me completely engrossed in the story and quickly turning pages to see what happened next. The writing style of Adite is simple, lucid and a bit poetic. I loved the whole you-are-infuriating-but-still-I-love-you aspect of the book and also felt stirred by the plight of a small girl who sees her family destroyed and promises revenge. Adite has spun a web of lies, deception and misunderstanding which will test both Krish and Maya. Maya will be forced to choose between her past promise of revenge and the present promise of a good life with Krish. I received the book from the author to read and review and I am very thankful to her for introducing me to this beautiful love story. The above review is my honest and unbiased opinion and in no way influenced.